The Zeonic Geofront: Life Size Eva Head at Fuji-Q Highlands! When we were in Japan a couple of years ago, one of the highlights of our trip was a visit to Fuji-Q Highlands at the base of Mt. Fuji. Fuji-Q is famous for it's Gundam ride (or more like Gundam Experience). It also is home to some of the fastest and largest roller coasters in the world. Fuji-Q is a great amusement park, because it feels uniquely Japanese. Tokyo Disney was great, but it still felt like Disney Land. Fuji-Q is something you can only experience in Japan. But I digress. 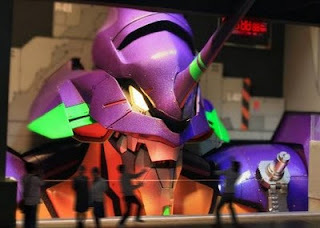 Fuji-Q is going to be even more uniquely Japanese come July when they open their Life Size Evangelion (head) display. Presumably it is supposed to look like you are inside NERV. Along with the head there will also be a life size replica of the entry plug (that I hope you can get inside), and a life size version of Kaworu (seriously? Not Asuka or Rei?). Seriously, I am so excited about this news I can hardly type from my mind wanting to explode.